WSRW launches today, for the first time, a complete report listing all the clients, volumes, values and shipments relating to Morocco's exports of phosphate rock from occupied territory. Western Sahara Resource Watch today publishes a detailed overview of the companies involved in the purchases of the phosphates from occupied Western Sahara. 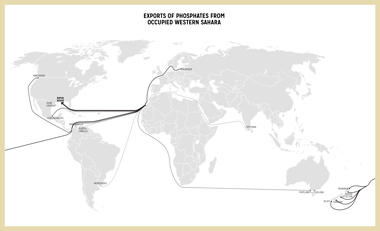 The phosphate rock is illegally exploited by the Moroccan government in Western Sahara, a territory that it is brutally occupying. 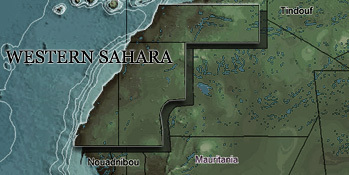 The exports are Morocco’s main source of income from the occupied territories. Representatives of the Saharawis have been consistently outspoken against the trade, both in the UN, generally and to specific companies. The overview is made on the basis of tracking and anlysing 109 bulk vessels that arrived port in El Aaiun, Western Sahara. The list we present in this report is complete for the calendar years 2012 and 2013 to the best of our knowledge, naming nearly all the shipments of the phosphates from occupied Western Sahara. This report attributes the purchases of Morocco’s production in Western Sahara in 2013 to ten named and two yet unknown importers in ten countries internationally. The two companies PotashCorp (US) and Lifosa (Lithuania), alone, accounted for 50% percent of all purchases. The report details a total exported volume from Western Sahara in 2013 at 2,2 million tonnes, with an estimated value of $330 million, shipped in 48 bulk vessels. That is an increase of 400,000 tonnes from 2012, the report shows. Of the ten named companies identified as importing phosphates in 2013, six are listed on international stock exchanges or are majority owned by enterprises which are listed. Four of those have been subject to blacklistings by ethically concerned investors due to this trade on grounds of human rights or international law. The Canadian company Agrium started its imports only in September 2013, and has thus yet not been subject to known investor exclusions. Of the remaining four companies not registered on any stock exchange, two are farmer owned cooperatives in New Zealand, while the two remaining are fully or partially owned by the Government of Venezuela. Rectification: After publishing of the report, WSRW has discovered an error on page 16 in the document. Lifosa's parent company EuroChem did indeed report to correspondence from WSRW, in a letter on 28 March 2014. In addition to naming the involved companies, this report also identifies potential buyers, as well as a “green list” of companies previously associated with such trade, but which no longer purchase. WSRW calls on all companies involved in the trade immediately halt all purchases of Western Sahara phosphates until a solution to the conflict has been found. Investors are requested to engage, or divest unless action is taken.